My last post ended like an episode of “24.” Right before the big reveal, the clock comes on and counts down to a black screen, leaving you frustrated and angry at the TV for the next week. The LMS market has a lot of players in the space, well over 700 and growing. With much time spent researching, seeing demos etc., we narrowed it down to make our final decision. However, after some careful reflecting and looking at what we wanted for an end result with employee training, we had some second thoughts. And since one value we live by the most is “push the boundaries,” we decided that a traditional LMS was just not the right fit for us. The reason? We are approaching learning and development from a radically different perspective. A new hypothesis, if you will, on key elements of successful L&D. How looking backwards will, in reality, move us forward. Why was the LMS not the right fit? It wasn’t so much the one we had chosen; to be frank, most systems are content-driven with testing/exams bolted onto them. And that’s backwards from how it should be. Think about it, if you take a course first, then take a test related to just that particular subject, what exactly have you “learned”? How do we measure that you’ve actually learned something and can apply it right away? All you have done is shown that you can memorize content. Not to mention that most “training” courses have a very low bar to “pass.” So, we had a decision to make to find a learning management system alternative. Do we rely on the quantity of courses to label our employees as having 'learned,' or do we look at the quality of those courses instead? If I tell you that I’ve completed an entire sales catalog of training but my sales numbers (renewals, new clients won etc) haven’t changed, vs. someone who's taken only a handful of courses and has seen their sales increase by any percentage, to me that speaks volumes! If you’re looking at training to simply cross it off a list — the employee has finished, so we’re good here — then you’re always going to maintain the status quo. It doesn’t matter what format, whether you’ve got flashing lights, quippy videos or longform content. 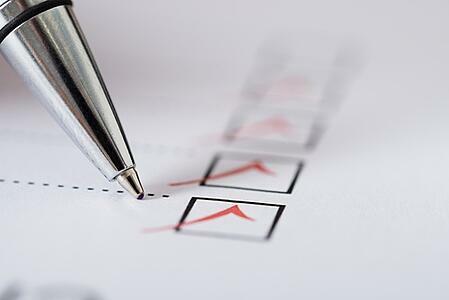 It still remains an ineffective learning checklist. "Our people love their job and want to learn. So what do I need to give them to love their job more?" 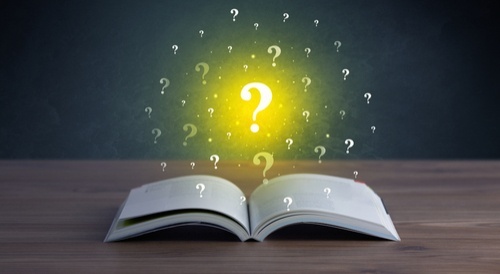 What do I need to give them to understand and believe in the direction of their organization, to understand how their role impacts and contributes to the organization’s purpose, mission and objectives? How can I guarantee that these employees genuinely want the organization to succeed? If these bullets sound familiar to you, that’s because we believe that L&D is a critical block in employee engagement, and your goals of L&D should follow that of achieving an engaged workforce. Once you’ve engaged your employees, your job as an L&D manager is to reinforce their engagement, and make them create a better place to work. So what is our solution then? 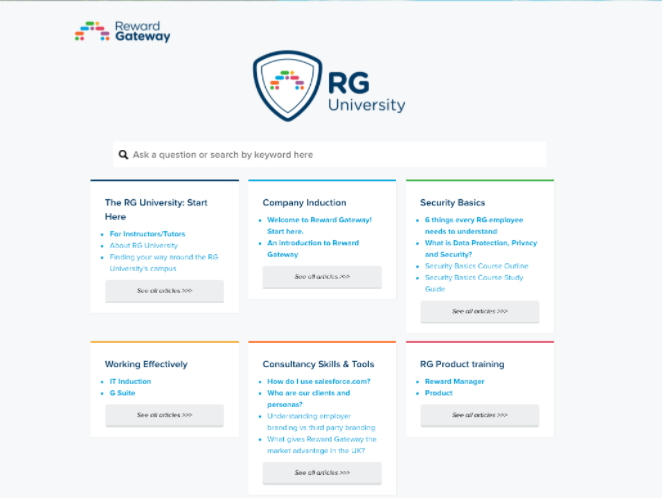 We have launched what we call “RG University” through a company called HelpJuice. Its format is extremely simple and serves as an incredible repository for articles covering everything that we at RG offer. The articles are displayed in a blog-style format. But obviously for L&D, we need to do quite a bit more and were given a blank canvas to make some amazing content. 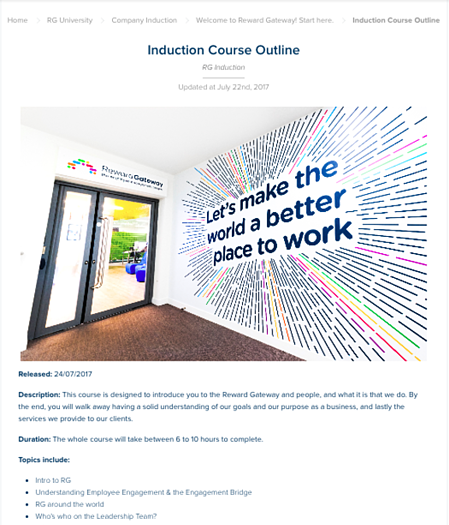 What you see below is a screen capture from our induction course. Each course comes with a breakout like you see here, and a study guide. The study guide contains vital information that helps employees’ learnings go further by giving them supporting materials that will give their learning a well-rounded approach. If your staff are into their job for more than their paycheck then they will own their own L&D and see themselves grow. Again, if you’re having trouble with your employees not wanting to learn and grow, then you might just have an employee engagement issue. We at Reward Gateway believe in true ownership and one aspect of that, which also is a value of ours, is Love Your Job. We firmly believe that our staff is the best of the best and are committed to not only bettering themselves but their job too! Hence why we have chosen to launch our own form of learning via our new learning portal. It’s super simple, just write what you need to write. If you have a topic that needs to go out quickly, drop it right in and it’s ready for consumption. At a fast-paced company like ours, this is critical to put new training in place ASAP. The idea is that we place only the most important and valuable information on there. Yes, there will still be traditional learning that is created (as I’ve already outlined) but instead of forcing people to take it and testing them on a specific course, it’s really up to them to grow themselves by finding the information they need. It reinforces our view that successful learning is done when the learner actively seeks to better themselves, not an individual mandating they learn. You are inspiring people to learn and achieve great things, rather than demanding a quota be met. So ask yourself, what’s in it for them? At the end of the day, the are better and more effective at their job. In my next post, I’ll delve into more details about our new testing program and approach and how yet again, we are pushing the boundaries with this. 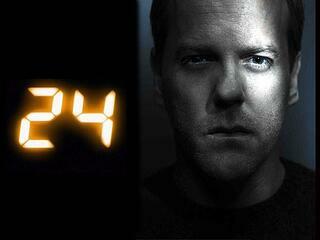 For now, my “24” clock has just about run out. ‘Till next time!